Joining the tech industry at 19, in 1984, I have experienced the dominance of technology into business. The belief that automation will allow 4 day weeks and increased leisure, the values of businesses that have been destroyed by telephone automation, outsourcing and placing their profit ahead of the customer experience. We are now in a period of technology where we question its humanity. Does it help, or does it actually drive up stress? Many of us have witnessed this, we love the efficiency and choice that the Internet gives us, allowing us to do our banking online at 2am, buying online and getting deliveries the next day. We love the speed and the lower prices, we have become intolerant and impatient, a generation now emerging of ‘I want it now’. There are many advantages, and I guess we embrace them celebrate the good and moan about the bad. When it doesn’t work, we suffer stress, the circular experience of being put back to the same telephone switchboard and unable to talk to a human as we press the choices given on our phone pad. The determination to place technology between the customer and the company is understandable, the constant ‘race to zero’ forced by the consumer, price being the critical decision making motivation, no wonder companies are investing in automation more than people to compete. I think we are all empathetic enough to the reasons companies are being led into this, forced to implement. They cannot survive without implementing and innovating their processes. So, a fairly balanced start to my thoughts today, however, here is my emotional reaction…. Common sense, where is the moment in a companies processes that says, this is an anomaly ,an “abnormality, a blip on the screen of life that doesn’t fit with the rest of the pattern”. Let’s allow our heart to rule our head now and treat this person differently. The ‘get out of jail moment when a person in an organisation can be empowered to say “hey, wait a minute, this person does not fit the process we have yet they are important us. This sadly applies to the Police Force (I know this from painful experience) Local Gov, Telco’s, Banks as well as the Corporate commercial companies and I think it needs to apply to us all when we build our businesses processes. It must apply to our daily emotions and thoughts around our business. It means we need to be taught to listen, empathise and train ourselves and our staff to be human. In a world when technology is so prevalent and dominant, we need to talk, to seek out exceptions, be clear on the values we have as leaders and talk and lead from the heart. Times are changing, as a world individuals are making their stand, from intolerance to bosses that use their power, to those who avoid tax, to the daily desire to be heard and treated as a person not a number. I am so intrigued where this is all heading. Young people are talking about digital detox, wanting face to face, driving their futures by their hearts, purpose and their why. Even myself, a evangelist of social networking, I now want to take community offline and blend with the online. I love the shift, the transparency and the open hearts that we are allowed to have, no longer seen as a weakness. 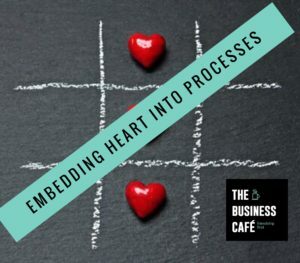 So, I guess today, my thoughts are about how do we embed our hearts into our processes and despite the need to embrace digital technology and all the huge productivity benefits of this, how do we lead our businesses with common sense, servant leadership and put humans, not technology into the centre of our priorities. Yet, at the same time scale, keep costs low and ensure our business is sustainable. I think these are exciting times, and it starts with leadership. All of us, even as a self-employed one-man/women band are leaders. We lead thoughts, lead our clients and lead our business. I wonder if we always lead with heart, when technology dominates and overwhelms and so often forces us to sit and do stuff that feels so heartless, cold and techy. I bit of a rant, a few thoughts, all motivated by the news and the shifting times. The exposure and the voices, and the desire for a world that treats us all a bit better.